The eighth day of August is a particularly lucky day of the year in east Asian cultures. 8/8/2015 marks the wedding day of my brother-in-law, coinciding with the 48th anniversary of his parents! You may recall that the Beijing Olympics opened on 8/8/2008, which was not a coincidence. The Atlanta Track Club annually holds the Jog Days of Summer 5K race near Chastain Park, on the north side of Atlanta. Last year we were in New York City celebrating my mother-in-law's birthday (not on 8/8 but a few days later), and I wasn't sure if I would manage to run this morning with all of the activity around the wedding. But since it was a free race for members, I signed up a few weeks ago. If there had been a family breakfast or other event this morning, I would have joined that instead. But with our visitors sleeping in late, I decided that I would prefer to run and could get back home by 9 am before anything wedding-related began. 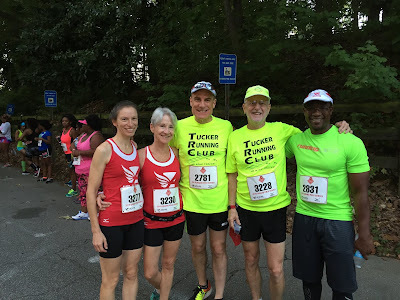 Part of my motivation for running was to join some of the other members of the Tucker Running Club, although only two of us had shirts to wear for today's race. I could also burn off a few pounds from last night's Chinese banquet, to make some room for tonight's Korean buffet. Kathy Wiegand, Kathie Walker, me, Curt Walker, and Brian Minor. and Brian is new to the club and the latest printing of shirts has not yet arrived. The weather was clear but relatively warm, 73 deg F at the start, with 89% humidity recorded. I wasn't feeling that fast when I arrived at the race, and discovered that I had left my shot of Beet Juice at home, arriving only with an empty bottle left over from last Saturday's trail race! But after warming up for a few minutes, I felt that I might be able to run fairly well. I had warmed up around the first part of the course, noting that there would be an uphill finish, which I wondered how I would handle. Lining up in wave B, for runners with a pace of 8:30 minute / mile or faster, I set my Garmin at an 8:00 minute / mile pace. I didn't think that I could maintain an 8 minute (7.5 mph) pace for 3.11 miles, but that's essentially what I would need to do to break my longstanding goal of running a 5K faster than 25 minutes. The airhorn sounded for wave B precisely 2 minutes after the first wave had started, and we moved forward quickly. The start was downhill and so most of us were running quickly, although I had to slow down to avoid running down a couple of women that were jogging a bit more slowly than the rest of the group. I figured that would help me to avoid going out too fast, although when I checked my watch after the first minute, I was running only about 8:30 minute / mile pace. Turning onto West Wieuca Drive, I gained some clearance and tried to increase my speed a bit, but the road was gently uphill. I could feel the dampness in the air from the humid morning. At one point we were running directly into the morning sun and the light was searing my retina when I couldn't block it with the visor of my cap, even wearing sunglasses. But when we made the sharp right turn onto Lake Forrest Drive, the road turned downhill, and I was able to lengthen my stride and gradually improve my pace. The clock at the one-mile marker was showing just past 10 minutes for the race, and my Garmin recorded a time of 7:58 for my first mile. 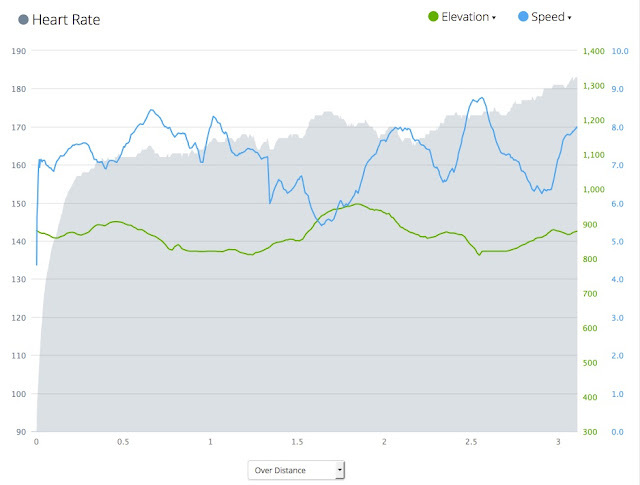 As the road leveled out, I could tell that I was slowing a bit, with my pace time now creeping above 8:00. We reached the water station, and I decided to accept a cup of water from the last volunteer, slowing to a walk to take a few sips and then pouring the rest on the back of my neck. That was a very good move, because the road went uphill just past the water station. We all slowed quite a bit, and I just focused on shortening my stride and increasing my step turnover. At the top of that hill, we made a very sharp left onto Powers Ferry Road. Although I was breathing really heavily, I was fairly pleased with my progress up the hill, and was now rewarded with a fairly substantial downhill run. I was able to pick up some speed, keeping up with most of the runners in my section and even passing a few who had either started out much too fast or had begun with wave A and couldn't quite keep up. As we passed the two-mile marker, I saw 19 minutes on the clock (about 17 minutes elapsed for me) and then saw on my Garmin that I had covered the second mile in 9:08, so that my overall pace was hovering just above 8:30 minute / mile. That was momentarily disappointing, but undoubtably was the best that I could have managed with the challenge of the hill. The road momentarily leveled out, and then we enjoyed one more downhill where I passed a woman wearing the shirt from last week's trail race. She had passed me around the one-mile mark and so I was pleased to get ahead of her, for however long it might last. Some of the fastest finishers were jogging their cooldown pace in the opposite direction. One of the volunteers shouted out "Just a half-mile to go!" which helped me to bear down and try to maintain some speed heading uphill. Around the 3-mile mark, we turned onto West Wieuca Road to close the loop, and I was pressing hard, determined that no one was going to pass me, at least not easily. I was getting warnings on my pulse but was close enough to the finish where I wasn't worried about running out of gas. Otherwise I wasn't checking the Garmin at this stage, but afterwards saw that I ran the third mile in 8:12, which was quite good for me at that late stage in the race. We made a left turn to head for the finish line, which was definitely uphill. I had the sensation that the pack of runners ahead of me was increasing their distance from me, which encouraged me to press ahead with one final burst of energy and so I managed to keep up with them, and no one passed me on the final stretch. Heading for the finish chute, I saw Curt Walker lift his camera to photograph me, and saw 28:10 on the clock right before I crossed the finish line, official result 26:04. Tucker Running Club After. We all managed to smile! Kathy Wiegand won the women's masters category! Also it was Brian's first 5K race. He picked a really tough one for his premiere! This was a really tough race, perhaps the most challenging 5K that I have run, given the hills coupled with the temperature and the humidity. 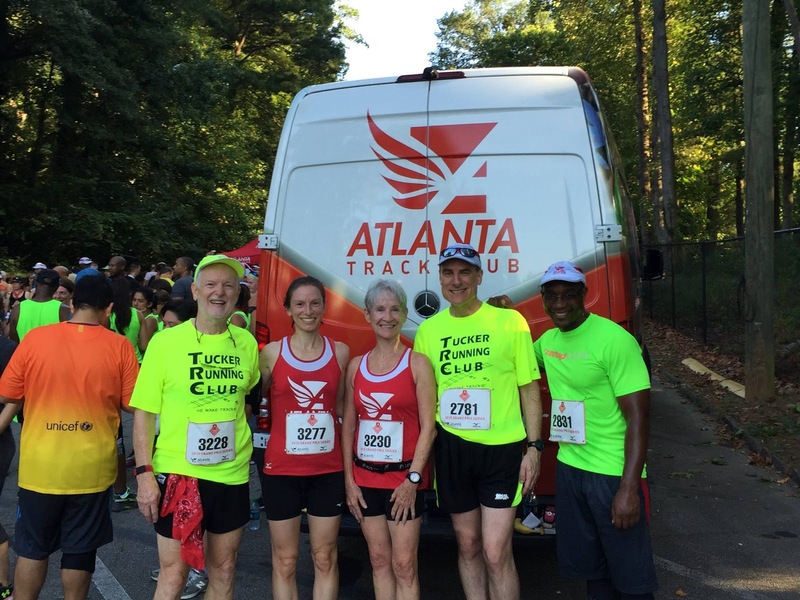 Although I seem to be stuck right around 26 minutes for the 5K distance, when I checked my times against competitors, I saw that most of the other runners had also clocked slower times than usual, so I felt better about my performance when I saw their numbers. With my current level of training and fitness, I think that I managed the race strategy to achieve my best possible effort, so I was satisfied with my outcome given the conditions. Goal C: To get in a 5K race between my brother-in-law's wedding rehearsal dinner and wedding ceremony; Achieved! As you can see, my C goals are fairly modest, but at least I now have a baseline time for this course, as a benchmark for future years. And I made it home just after 9 am! Goal B: To test my stamina in a summer 5K, temperature above 70 deg F; Information gained! With 73 deg F at the start of today's race, I think that I may have run the race quite well: overall I was 245th out of 1008 finishers, and 10th out of 35 in my age group. I'm usually closer to the 50th percentile in my age group, sometimes considerably slower, so I was pretty happy with that age group outcome. Goal A: To run a certified 5K in less than 25 minutes; A full minute slower, but encouraged that I didn't bonk in the warm and humid air. I'm excited to consider what I might be able to run when temperatures drop in the fall. I ran this one a few years ago and it's a tough course. The uphill finish is no fun. Great job. Nice to finally meet you last night! 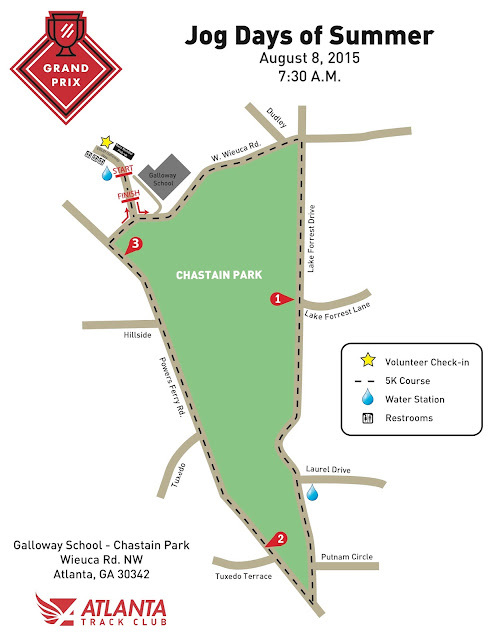 Ya, Chastain is tough. Good race!